Range in Japan Ogasawara (Chichijima and Hahajima Is. ), Daito (Kita-daitojima and Minami-daitojima Is. ), and Sakishima (Ishigakijima, Iriomotejima, and Hatomajima Is.) Islands. Origin Saipan (Ogasawara population); Minami-daitojima Is. (Ishigakijima population); Ishigakijima Is. (Hatomajima population), etc. 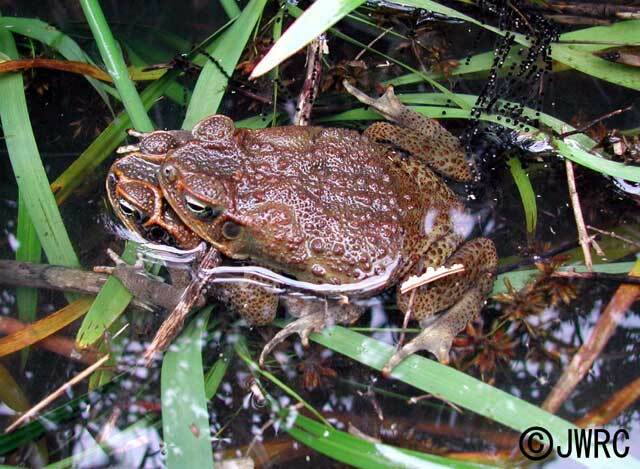 Impact Predation on invertebrates; Competition with native species; Toxic to predators (e.g., several snakes, birds, and wild cat); Water pollution by infestation of tadpoles. Introduced range in other countries Hawaii, Philippine, New Guinea, Australia, and several Pacific Islands. Kidera & Ota (2008) Can Exotic Toad Toxins Kill Native Ryukyu Snakes～ Experimental and Field Observations on the Effects of Bufo marinus Toxins on Dinodon rufozonatum walli. Current Herpetology. 27(1):23-27. Tyler (1989) Australian Frogs. Reed Books. Zug & Zug (1979) The Marine Toad, Bufo marinus: a natural history resume of native populations. Smithonian Contributions to Zoology. 284:1-58.